West Side’s boys and girls tennis teams finished runner-up in the District Tennis Match held yesterday at Fairfield Bay. Haley Gentry and Madison Bailey earned district runner-up in a very close third set that went to a 5-7 tiebreaker in girls doubles play in favor of Conway Christian Robbie Schmidt and Ashton Klepko earned district runner-up in boys doubles, losing in the finals in two sets to Conway Christian. Kamren Johnson and Alissa Allen finished 3rd in girls doubles beating Conway Christian. Finishers in the top three qualify for the state tennis match. Other top finishers include Jared Cothren and Tanner Fife, who finished 4th in boys doubles, and Alex Southerland, who finished 4th in girls singles. The three doubles teams will be headed to the State Tennis Tournament on October 16-17 in Conway at the University of Central Arkansas. 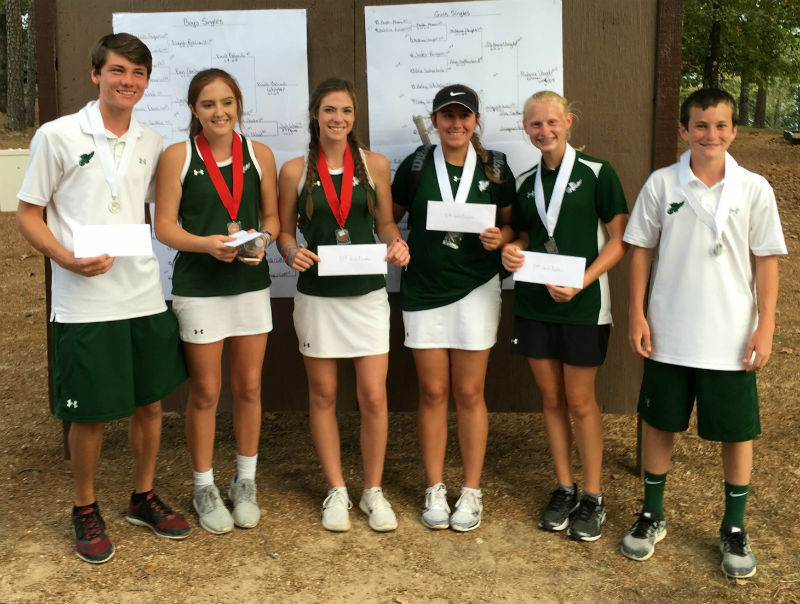 Pictured (from left) are state qualifiers Robbie Schmidt, Kamren Johnson, Alissa Allen, Madison Bailey, Haley Gentry, and Ashton Klepko.